Background & objectives: Prevention of malaria in pregnancy is a key intervention for reducing maternal mortality and morbidity in the tropical region of Africa. The present study was aimed to determine whether the administration of two doses of intermittent preventive treatment (IPT) with sulphadoxine-pyrimethamine (IPT-SP) and use of insecticide treated nets (ITNs) is correlated with reduced incidence of malaria in pregnancy or not. Methods: In total 270 pregnant women were randomly divided into three groups; A, B and C depending on the use of IPT and ITN, and were tested for malaria in pregnancy. Results: The overall prevalence of malaria parasitaemia was found to be 57.8%. The prevalence rate was 56.7% for group A (IPT alone); 45.6% for group B (IPT and ITN) and 71.1% for group C (None). The difference between group A and C was statistically significant (χ2 = 4.07, OR = 1.88,p < 0.04). Also, women in group A were one and half times more susceptible to malaria than women in group B (χ2 = 2.22, OR = 1.56,p < 0.14). Interpretation & conclusion: The use of IPT-SP and ITN was found to be significantly associated with reduced malarial infestation during pregnancy in the study area. There is a need to scale up both the strategies in order to reduce the high burden of malaria in pregnant women. Malaria is one of the world’s deadliest diseases, and pregnant women are particularly vulnerable to malaria infection due to their reduced immunity. As a result of this decline in immunity, they experience increased parasitaemia leading to fatal disease course,. Adverse pregnancy outcomes associated with malaria in pregnancy include maternal anaemia, intra-uterine growth retardation, intrauterine fetal death, low birth weight (LBW), perinatal and neonatal morbidity and mortality. In Africa, the prevalent poor nutrition, micronutrient imbalances, HIV coinfection, poverty and limited access to effective primary health care and emergency obstetric services exacerbate the adverse impact of malaria on pregnancy. Additionally, in cases, wherein women with malaria parasitaemia remain asymptomatic due to acquired immunity, the survival and well-being of the baby is threatened due to the effect of placental malaria. Due to high prevalence of malaria in pregnant women in Africa,, developing and strengthening national and regional capacity for prevention and control of malaria during pregnancy is a high priority in the region. Earlier, regional strategies for achieving this mainly involved personal protective habits, and use of chloroquine and pyrimethamine chemoprophylaxis,. Unfortunately, due to growing resistance of malaria parasites to these drugs and the poor compliance of the women to the treatment, these strategies lost efficacy and had to be abandoned. Therefore, the current strategies for control of malaria in pregnancy are based on three strategies. These are (i) the use of long-lasting insecticide treated nets (LLINs), (ii) intermittent preventive treatment (IPT) using sulphadoxine-pyrimethamine (SP) combination, and (iii) prompt diagnosis and effective treatment of malaria infections. Intermittent preventive treatment involves a curative dose of an effective antimalarial drug at predefined intervals during pregnancy, irrespective of presence or absence of malaria parasitaemia. The World Health Organization (WHO) recommends the use of SP in IPT for malaria control during pregnancy in malaria endemic regions. This was based on the findings from randomized controlled trials and prospective studies, demonstrating the efficacy, safety and cost-effectiveness of SP in preventing maternal anaemia and low birth weight (LBW) in newborns,. The recommendation specifies, the administration of at least two doses of SP after quickening with at least four weeks interval, and emphasizes the direct observed treatment (DOT) approach in order to ensure maximal compliance by the pregnant women. In Africa, available evidences have shown that IPT-SP is effective in reducing malaria parasitaemia, anaemia, placental parasitaemia and low birth weight both at the national and individual levels,,. For instance, van Eijk et al have shown that the use of IPT-SP, among 889 pregnant women, who delivered in a provincial hospital in Kenya, was associated with significant reduction in placental malaria and low birth weight. An adjusted mean increase in birth weight of 61 g was observed for each increment in number of SP doses (≥2 doses grouped together). Similarly, Fawole et al evaluated the effectiveness of IPT-SP in the preventing maternal and placental malaria in 983 parturient mothers in Ibadan, southwestern part of Nigeria, where the risk of malaria is present all year round. They reported that the use of IPT-SP significantly reduced the prevalence of maternal parasitaemia, placental parasitaemia, and maternal anaemia. The mean birth weight of newborns was also significantly higher among the women who took IPT-SP. Insecticide impregnated nets is another strategy recommended by WHO for preventing malaria in pregnancy, whose efficacy in preventing malaria infection during pregnancy and the associated complications had been severally reported,. In spite of these, there are challenges to the widespread use of these interventions in Africa, which mainly includes poor knowledge and implementation of IPT-SP among the pregnant women and healthcare providers. For example, in Nigeria only ~13.9% of the primary health care providers knew about the new WHO strategy. Also, accessibility and coverage of malaria interventions in the region is constrained by poverty, limited health infrastructure, ineffective drug policy regulations and other healthcare problems. It is known that at least 40% of pregnant women in developing countries receive no antenatal care and nearly 31% deliver at home. Even when the women attend ANC, late presentation is common, with nearly 25% of them presenting for the first time in the second trimester and for the second time during the third trimester. This resulted in lowering of the effectiveness of ANC and IPT-SP related services in the area. Rural residents are relatively more disadvantaged than their urban counterparts in terms of geographical and financial accessibility to ANC. The economically poorer women whether in rural or urban areas are generally more deprived. However, the biggest challenge to the efficacy of IPT-SP seems to be the emerging parasite’s resistance to SP which has been widely reported in the region. This reflects the need for a periodic review of the local efficacy of this strategy in preventing malaria in pregnancy. This need becomes even more compelling in southeastern Nigeria, in view of the recent reports of very high malarial parasitaemia (79.3%) among pregnant mothers attending antenatal clinics. This study examined whether the administration of two doses of ITN-SP reduces the incidence of malaria in pregnancy. It also evaluated if there is a correlation between IPT usage and haemoglobin levels among the pregnant women. The finding from this study may form the basis for intensifying the drive for an improved knowledge and utilization of IPT in prevention of malaria in the area. It will also enable the hospitals to assess the success achieved in the implementation of free IPT programme for all pregnant women attending the antenatal clinic. This was a case-control study, involving 270 pregnant women, who were divided equally into three groups, viz. Group A–Pregnant women who received two doses of IPT with SP alone in the first two trimesters; Group B–Pregnant women who received IPT-SP during the first two trimesters and also used ITN; and Group C– Pregnant women who neither received IPT-SP nor used ITN (Control). The study was carried out in Nnamdi Azikiwe University Teaching Hospital (NAUTH), Nnewi, Anambra State, Nigeria. The hospital is a tertiary health institution with a catchment area of the five states of the southeast geopolitical region of Nigeria. These are Anambra, Enugu, Abia, Imo and Ebonyi states. Participants were recruited from the antenatal clinics (ANC) and comprised of consecutive antenatal mothers, at ≥ 30 wk of pregnancy, presenting at the ANC for treatment and care. Approximately 50 pregnant women are seen daily at the antenatal clinics. All pregnant women at ≥ 30 wk attending antenatal clinic in the hospital. Pregnant women with the following history were excluded from the study–Use of malaria prophylaxis other than SP-IPT during first two trimesters, active malaria at the time of presentation, severe pregnancy complications, multiple gestation, recent treatment for malaria, HIV in pregnancy, and sickle cell disease in pregnancy. The minimum sampling size was determined using the Fisher's formula for sample size determination; n = Z2pq/d2, where, n = Minimum sample size for a statistically significant survey, Z = Normal deviate (1.96) at 95% confidence interval, p = Prevalence of malaria in pregnancy in Nnewi (79.3%), q = 1−p, d = Margin of error acceptable or measure of precision (0.05). This was increased to 270 to provide for attrition; hence, n = 270 pregnant women. This population was categorized equally into three groups based on the IPT-SP doses received and usage of ITN. Consecutive pregnant women at a gestational age of ≥ 30 wk, attending ANC were recruited into the study. After due explanation and obtaining informed consent from the women, sociodemographic data were collected through the use of pretested, coded semi-structured questionnaires which were either self-filled or filled with the help of interviewer, depending on the method preferred by the respondent. Information obtained included age, parity, gestational age, HIV status, occupation, education level, occupation of the husband and religion. The information, whether the patient had completed the two courses of IPT was also obtained and cross-checked with the records in the patient’s folder. A proforma was used to record the results of the tests. Malaria diagnostic testing: The malaria status of the population was determined by the microscopic method. Thick and thin blood films were prepared from the blood sample of all enrolled patients and stained with 10% freshly prepared Giemsa stain at pH 7.2 for parasite identification and quantification. Parasite density was determined by counting the number of asexual parasites relative to at least 200 leucocytes in each thick blood film and assuming a mean leukocyte count of 8000/μl of blood. Blood smears were screened by a trained microscopist following standard, quality control procedure. Parasitaemia was expressed as the number of asexual forms of P. falciparum per μl of blood, and a blood smear was considered negative for malaria parasite only after reading of 100 highpower fields without detecting a parasite under a light microscope at 1000x magnification. Those subjects with active malaria were informed and encouraged to consult with their physicians for treatment. Data analysis was done using Epi-info statistical package, version 3.3.5. Results are presented as percentages for categorical variables and as mean ± SD for continuous variables. A two-tailed Fischer’s Exact test was used to determine whether the proportion of women who had malaria in pregnancy among IPT-SP users was significantly lower than those who did not take IPT-SP. One-way ANOVA test was used to compare the means of the studied population, while chi-square at 95% confidence interval was used to explore the association of selected sociodemographic characteristics with malaria in pregnancy. A p-value of < 0.05 was considered as significant. Data are presented in [Table 1]. Ethical approval was obtained from the Nnamdi Azikiwe University Teaching Hospital ethical review committee. All the women had the right to privacy and were given the option of withdrawing from the study at any time after counseling. 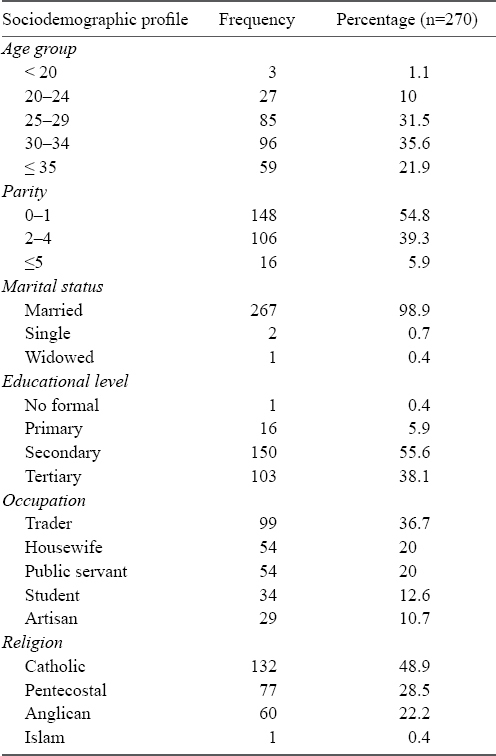 As shown in [Table 1], most of the women were married (98.9%; n = 267) and mainly traders (36.7%; n = 99) by profession. Majority of them had completed at least secondary education (93.7%; n = 253) and almost all of them (99.6%; n = 269) were Christians by religion. The age of the women ranged from 19 to 44 yr with a mean age of 30.41± 4.8 yr. More than half (54.8%; n = 148) of the women belong to the parity group of 0 – 1(Mean parity = 1.68 ± 1.64). There was no significant difference in either the mean parity (F-stat =0.12; p = 0.88) or mean age (F-stat = 1.9; p = 0.14) among the three studied groups. Out of the 270 women, 156 had malaria parasitaemia in peripheral blood giving an overall prevalence of 57.8%. The prevalence rate of malaria parasitaemia was 56.7% (n = 51) for group A (IPT alone); 45.6% (n = 41) for group B (IPT and ITN) and 71.1% (n = 64) for group C (Control). The difference in the prevalence rates of malaria parasitaemia between group A and group C was statistically significant (χ2 = 4.07, OR = 1.88, p < 0.04); but, it was not significant between group A and group B. However, women who only took IPT were one and half times more likely to have malaria parasitaemia in pregnancy when compared to those that slept under ITN in addition to receiving IPT-SP (χ2=2.22, OR = 1.56, p < 0.14). Among the women with parasitaemia, 76.9% (n = 120) had mild parasitaemia; 15.3% (n = 24) moderate parasitaemia, while 7.7% (n = 12) had severe parasitaemia. Malaria in pregnancy remains a public health burden in tropical Africa because of its association with maternal, fetal and neonatal morbidity and mortality. The prevalence of malaria in pregnancy varies among nations and even within countries. In this study, a high prevalence rate of 57.8% was found among the pregnant women. This rate is almost similar to that reported by Nwagha et al in Enugu (58.4%), but 29% higher than that reported in Abakaliki, all in Southeast region of Nigeria. In Nnewi, prevalence rates of 79.3 and 80% had been reported in earlier studies by Nnaji et al and Onyenekwe et al, respectively. The overall rate of 57.8% found in this study, though lower than the earlier reported rates in Nnewi, is still too high and indicates the need to intensify the campaign against malaria in pregnancy through the recommended focused antenatal care, use of IPT-SP and ITN as well as timely and appropriate treatment of established cases of malaria. The possible consequences of persistent peripheral malaria parasitaemia in pregnancy include low birth weight, preterm deliveries, fetal growth restriction and intrauterine fetal death. The control of malaria in pregnancy has been a challenge to the African countries and has largely been anchored on chemoprophylaxis with antimalarial drugs, protective mechanisms such as insecticide treated nets and in house spraying. The WHO recommends the use of SP for IPT for malaria during pregnancy in malaria endemic regions based on the findings from a number of randomized controlled trials and prospective studies conducted in Kenya and Malawi in the 1990s. It has been shown that IPT-SP is effective in reducing malaria parasitaemia, anaemia, placental parasitaemia and LBW; however, due to the presence of parasites resistance, the efficacy of the drugs may vary with regions. In this study, the use of IPT, correlated with reduced malaria parasitaemia in peripheral blood and anaemia during pregnancy, proving the local operational efficacy of the strategy in Nnewi. A similar finding was documented by Fawole et al in Ibadan, southwestern part of the country. The women were randomized into three groups: Group A received IPT-SP; Group B received pyrimethamine only, while Group C did not take any chemoprophylactic agent (control). They reported that the prevalence of maternal parasitaemia, placental parasitaemia, and maternal anaemia were significantly reduced in the IPT-SP group. The mean birth weight was also significantly higher in the IPT-SP group. It was concluded that IPT-SP is effective in preventing maternal and placental malaria as well as improving pregnancy outcomes among parturient women in Ibadan, Nigeria. Similar results had been documented in other parts of Africa,. The implication therefore is that, if properly implemented, the IPT-SP intervention has the potential of reducing the adverse impact of malaria in pregnancy. This study also demonstrated an added benefit of ITN to that conferred by IPT-SP in reducing malaria parasitaemia and anaemia in pregnancy. The women who only took IPT-SP (Group A) were found to be one and half times more susceptible to malaria infection in pregnancy than to those using ITN in addition to receiving IPT-SP (χ2=2.22, OR = 1.56, p < 0.14). The effectiveness of ITN as demonstrated in this study is a further incentive to scaling up the use of ITN in the area. Therefore, given the very high prevalence of malaria in pregnancy in the area as found in this work and other studies,, it becomes a public health priority to pursue with renewed vigour, an increased use of the nets by the pregnant women. Although, the study did not explore the reasons for non-use of the nets among the women, the documented impediments to the use of ITNs in the region include unavailability of nets and poor knowledge of the benefits of ITN by both the pregnant women and the health care workers. Therefore, scaling up the use of nets in the region must involve widespread sensitization, utilizing different avenues for public enlightenment including the print and electronic media. The sensitization should also include the health care workers. Enough nets should be provided by the government and donor agencies for the populace, especially the vulnerable group (pregnant women and under-5 children). The use of IPT with SP is associated with reduced malarial parasitaemia among the studied population. There is an added benefit from the use of ITNs. Therefore, there is need to develop innovative ways of scaling up their use in order to reduce the high burden of malaria in pregnancy in the area. World Malaria Report 2008. Geneva: World Health Organization 2008. Available from: http://www.who.int/malaria/wmr (Accessed on February 3, 2010). Brabin BJ. The risks and severity of malaria in pregnant women: Including a summary of current field research with identification of research priorities related to appropriate methods of prevention of malaria in pregnancy. Geneva: World Health Organization 1991; p. 1–67. Available from: http://apps.who.int/iris/ bitstream/10665/61511/1/TDR_FIELDMAL_1.pdf (Accessed on August 9, 2016). Breman JG, Alilio MS, Mills A. Conquering the intolerable burden of malaria. What’s new, what’s needed: A summary. Am J Trop Med Hyg 2004; 7(Suppl 2): 1–15. Cot M, Deloron P. Malaria prevention strategies. Br Med Bull 2003; 67: 137–48. Mutabingwa TK, Malle LN, de Geus A, Oosting J. Malaria chemo-suppression during pregnancy. II: Its effects on maternal haemoglobin levels, placental malaria and birth-weight. Trop Geogr Med 1993; 45(2): 49–55. Shultz L, Steketee R, Macheso A, Kazembe P, Chitsulo L, Wirima J. The efficacy of antimalarial regimens containing sulfadoxine/pyrimethamine and/or chloroquine in preventing peripheral and placental Plasmodium falciparum infection among pregnant women in Malawi. Am J Trop Med Hyg 1994; 51: 515–22. Malaria in pregnant women—2017 update. Geneva: World Health Organization 2017. Available from: http://www.who.int/ malaria/areas/high_risk_groups/pregnancy/en/ (Accessed on August 8, 2017). Parise ME, Ayisi JG, Nahlen BL, Schultz LJ, Roberts JM, Misore A, et al. Efficacy of sulfadoxine-pyrimethamine for prevention of placental malaria in an area of Kenya with a high prevalence of malaria and human immunodeficiency virus infection. Am J Trop Med Hyg 1998; 59(5): 813–22. Verhoeff FH, Brabin BJ, Chimsuku L, Kazembe P, Russel WB, Broadhead RL. An evaluation of intermittent sulfadoxine-pyrimethamine treatment in pregnancy on parasite clearance and risk of low birth weight in rural Malawi. Ann Trop Med Parasitol 1998; 92(2): 141–50. van Eijk AM, Ayisi JG, ter Kuile FO, Otieno JA, Misore AO, Odondi JO, et al. Effectiveness of intermittent preventive treatment with sulphadoxine-pyrimethamine for control of malaria in pregnancy in western Kenya: A hospital-based study. Trop Med Int Health 2004; 9(3): 351–60. Briand V, Denoeud L, Massougbodji A, Cot M. Efficacy of intermittent preventive treatment vs chloroquine prophylaxis to prevent malaria during pregnancy in Benin. J Infect Dis 2008; 198(4): 594–601. ter Kuile FO, van Eijk AM, Filler SJ. Effect of sulfadoxine-pyrimethamine resistance on the efficacy of intermittent preventive therapy for malaria control during pregnancy: A systematic review. JAMA 2007; 297(23): 2603–16. Fawole AO, Onyeaso NC. Perception and practice of malaria prophylaxis in pregnancy among primary health care providers in Ibadan, Nigeria. West Afr J Med 2008; 27 (2): 92–6. Terlouw DJ, Phillips-Howard PA, Hawley WA, Friedman JF, Kariuki SK, Shi YP, Kolczak MS, et al. Reduction of malaria during pregnancy by permethrin-treated bednets in an area of intense perennial malaria transmission in western Kenya. Am J Trop Med Hyg 2003; 68(Suppl 4): 50–60. Gamble C, Ekwaru JP, ter Kuile FO. Insecticide-treated nets for preventing malaria in pregnancy. Cochrane Database Syst Rev 2006; 2: CD003755. A strategic framework for malaria prevention and control during pregnancy in the Africa region. Brazzaville: WHO Regional Office for Africa 2004. AFR/MAL/04/01. Guyatt HL, Noor AM, Ochola SA, Snow RW. Use of intermittent presumptive treatment and bednets by pregnant women in four Kenyan districts. Trop Med Int Health 2004; 9(2): 255–61. Briand V, Bottero J, Noël H, Masse V, Cordel H, Guerra J, et al. Intermittent treatment for the prevention of malaria during pregnancy in Benin: A randomized, open-label equivalence trial comparing sulfadoxine-pyrimethamine with mefloquine. J Infect Dis 2009; 200(6): 991–1001. Gesase S, Gosling RD, Hashim R, Ord R, Naidoo I, Madebe R, et al. High resistance of Plasmodium falciparum to sulphadoxine/pyrimethamine in northern Tanzania and the emergence of dhps resistance mutation at Codon 581. PLoS One 2009; 4(2): e4569. Nnaji GA, Ikechebelu JI, Okafor CI. A comparison of the prevalence of malaria parasitaemia in pregnant and non-pregnant women. Niger J Med 2009;18(1):47–51. Hassan Titi. Inferential statistics. In: Bankole MA, editor. Handbook of research methods in medicine. Lagos: Nigerian Educational Research and Development Council 1990; p. 167–212. Nwonwu EU, Ibekwe PC, Ugwu JI, Obarezi HC, Nwagbara OC. Prevalence of malaria parasitaemia and malaria related anaemia among pregnant women in Abakaliki, southeast Nigeria. Niger J Clin Pract 2009; 12(2): 182–6. Wagbatsoma VA, Aigbe EE. ITN utilization among pregnant women attending ANC in Etsako West Lga, Edo state, Nigeria. Niger J Clin Pract 2010; 13(2): 144–8.